Iain Morrison: To go - Johnson or sevens squad? THE SRU board will decide the future of Scotland’s sevens squad at a meeting on Thursday. For financial reasons, Scotland are looking to get out of seven-a-side rugby (or go part-time) at exactly the time when the rest of the world is jumping on the wagon following Olympic status; even the ultimate Sevens sceptics Ireland are setting up a team. The SRU is attempting to link the decision with the expected loss of the Glasgow leg of the HSBC Sevens series and you fancy that the SRU’s Australian director of rugby Scott Johnson has already made the call, having told the players to grab any other offers, despite knowing little enough of Scottish rugby’s history or even his own players. In what other sport can Scotland claim top-seven status? Last season in Hong Kong the Australian was to present the jerseys to the sevens players before the tournament. After a less than rousing call to arms it slowly dawned on Johnson that he couldn’t present the jerseys because he didn’t know the players’ names. The team manager, somewhat sheepishly, stepped in. This is Scotland’s director of rugby. Fast forward one year, we are in the middle of the second last tournament of the season and the players in Scotland’s sevens squad still don’t know whether they have a job next season. They only got an audience with the SRU executives after complaining to the SRU president. (Incidentally Hugh Blake still doesn’t know if he is playing for Glasgow or Edinburgh next season). The high-handed manner in which they treat their players suggests an arrogance at the heart of this Murrayfield regime. Ignore for a moment all the history and heritage that comes with the abbreviated game in Scotland, invented by Melrose butcher Ned Haig in 1883, and instead ask why anyone would scrap the sevens squad when Scotland already struggles with just two full-time professional teams? With limited places elsewhere sevens serves as an additional pathway with numerous examples of Scottish players who have gone through the system and emerged all the better for the experience; Mark Bennett and Roddy Grant just two of the more obvious examples. Not only that but the sevens squad is heavily subsidised by the nice people at World Rugby (formally the IRB). In an effort to encourage the growth of the game outside the European/Sanzar heartland, World Rugby picks up the tab for the travel and accommodation of every team. Scotland are not just in danger of getting rid of their “third pro-team” but they are in danger of giving up that World Rugby subsidy. Ignore the history, the lack of opportunities for young Scottish players and that generous subsidy and concentrate instead on the performance. For years Scotland were useless, sevens was perhaps the most disappointing sport in last year’s Commonwealth Games. Not any longer. Under the auspices of new coach Calum MacRae the Scotland squad are vastly improved. Sitting in seventh place puts the Scots ahead of Argentina, Samoa, Wales and France and on course for their best ever finish. In what other sport can Scotland claim top-seven status? If Scotland quits the sevens circuit the way back is a hard one. They will be playing qualification tournaments in every sink hole around the globe for years to come as Olympic status unearths rich seams of funding for their rivals. That alone should be a huge incentive to ride out this financial storm. The sevens squad costs about £1 million per annum to run but it is difficult to see how when players are said to earn an average salary of approximately £25-30,000 p.a. (or £300-360,000 for a squad of 12 players), add three management and several thousands for training facilities and you still don’t get even halfway there. If the SRU was watching the bawbees closely it could have signed one fewer South African/Fijian/New Zealander for the pro-teams. If Murrayfield was scrimping hard to save the sevens squad they would not have hired Nathan Hines last week. I bow to no one in my admiration of what the big lock achieved as a player but do Scotland really need a third forwards coach with Vern Cotter and Jonathan Humphreys already in place? Then there is the director of rugby himself. Johnson is rumoured to be paid approximately £250,000 per year (which would equate to eight to ten players for the sevens squad). For that pretty penny he presided over the worst home performance that anyone can remember in the 2014 Calcutta Cup and was promoted to director of rugby, unchallenged, where he has repeatedly insisted that the job is not about him but solely about the betterment of Scottish rugby. So here is the question the board must ponder on Thursday. Does anyone out there, with the possible exception of the man himself, honestly believe that Scottish rugby will be better served by retaining Johnson on his weighty pay packet rather than reallocating his remuneration towards maintaining a national sevens squad? Anyone? 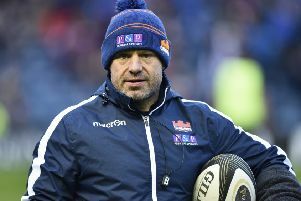 Johnson has always insisted his overriding concern is the good of Scottish rugby and now the Australian has the ideal opportunity to prove it.